A comfortable mattress tailored to the sleeper’s specific needs greatly increases the quality of sleep. At Au Lit, find a mattress that will provide you with years of superior comfort and energized mornings. All mattresses have the same function: to provide lasting comfort that gives you a peaceful uninterrupted night’s sleep. However, a mattress that is properly suited to your needs maximizes deep sleep duration by reducing pressure points. The technology at the core of the mattress plays an essential role in supporting the body and spine. This is why Au Lit carries a diverse range of mattress types. Firmness is a key factor when choosing a mattress. Your mattress must keep the body in a perfectly horizontal position, otherwise your muscles will be active and your sleep won’t be deep and restorative. *Please note that the levels of firmness and their names may differ from one manufacturer to another. A mattress’s firmness is chosen according to your height and weight. If you are tall and stocky, the mattress should be firmer. If you are lightweight or buying a mattress for a child, choose a softer mattress. 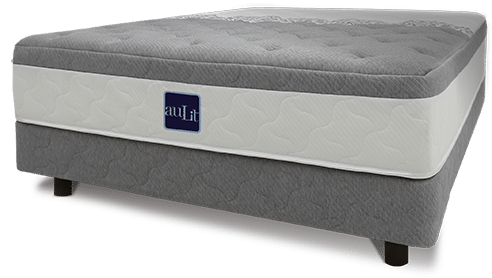 Why buy your mattress at Au Lit? Au Lit not only offers the widest choice of mattress models from leading brands, it also guarantees the best shopping experience. Need some guidance? Visit us in one of our stores.